We continue to celebrate the Year of William Meredith with award ceremonies, exhibitions, and poetry readings. 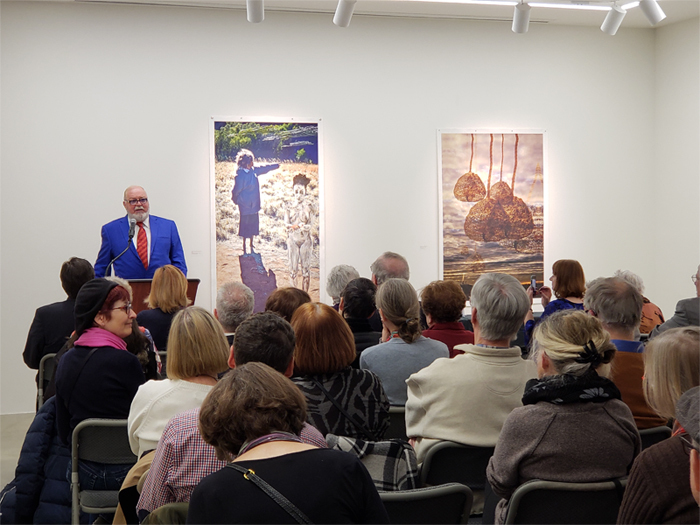 On February 6th, Bulgarian Ambassador Tihomir Stoytchev was the distinguished host to launch the 2019 William Meredith Award for Poetry and the Valentin Krustev Award for Translation during the sculpture exhibition, NANCY @ NINETY which runs through March 17th at the American University Art Museum. On March 2, the curator of the exhibition will conduct a Q and A with Nancy and fellow artists Sam Noto and Jacqui Concetta. April 12, Connecticut College will sponsor a symposium on the life and work of William Meredith (details to follow) during National Poetry Month. 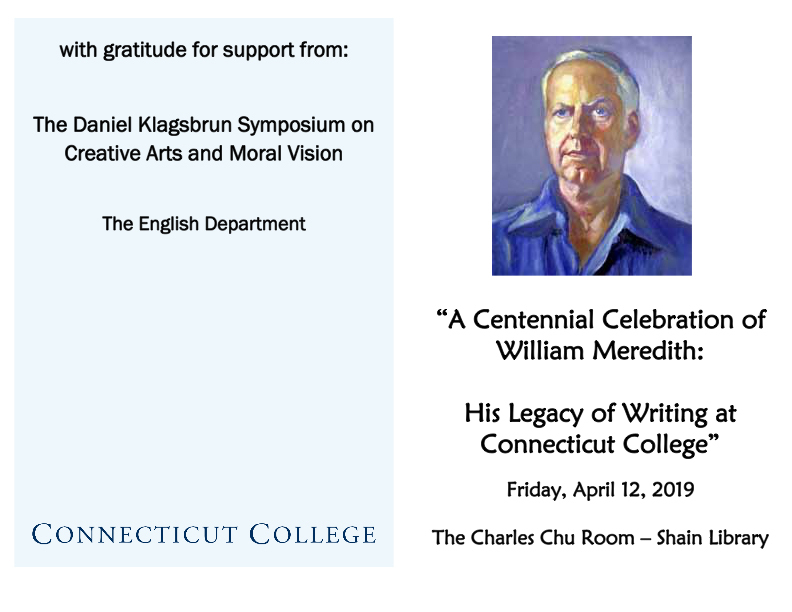 This festschrift is presented as a gift to the Centennial Celebration of William Meredith: His Legacy of Writing at Connecticut College April 12, 2019 in gratitude from the William Meredith Foundation and Poets Choice Publishing. 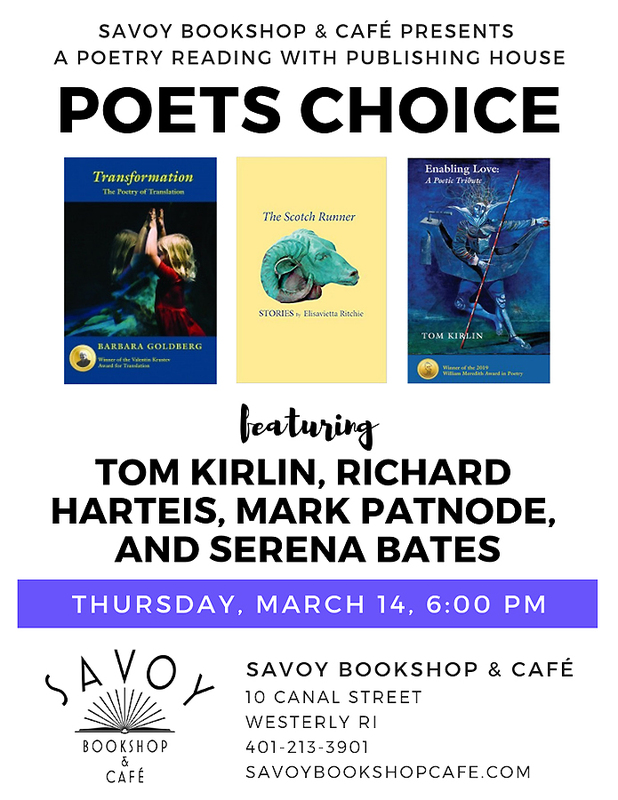 May 9th-12th, 2019 - Bulgaria: Barbara Goldberg and Richard Harteis will represent the foundation in Bulgaria at the Plovdiv Poetry Festival. Bulgaria assumes the presidency of the European Union this year and Plovdiv will host numerous arts programs. As a 501.c3 organization, contributions are tax deductible.) 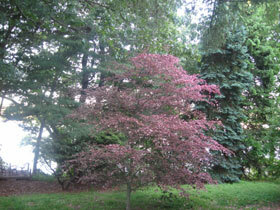 For now, we send very best wishes for a pleasant and productive spring. Nancy in front of Whimsy which was donated to the Bulgarian Embassy. 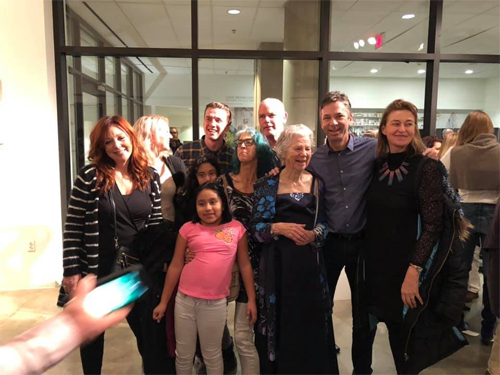 Many family members came from far and wide to be there for Nancys show. There was a tremendous turn out for both events. The embassy kindly provided wine for the award reception which also featured Bulgarian specialities for refreshments. 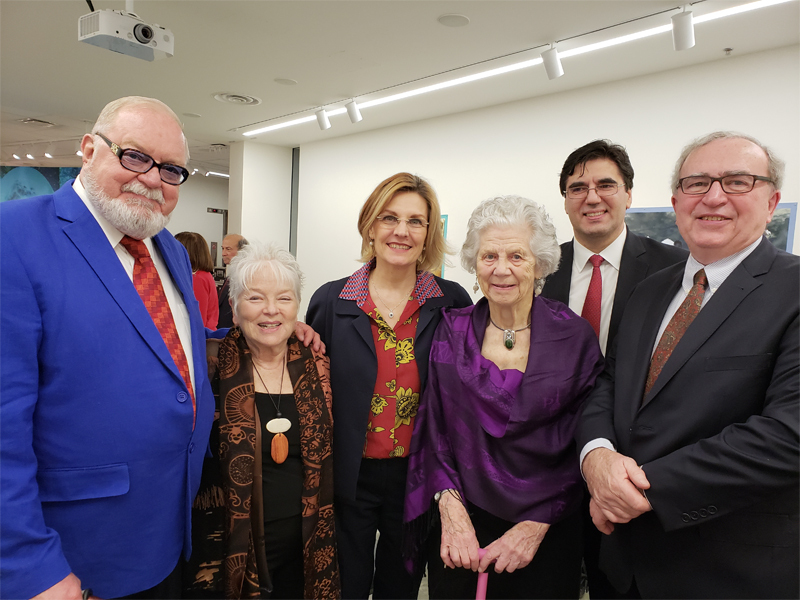 Award presentation: Richard Harteis, Barbara Goldberg, (winner of the Valentin Krustev Award for Translation) Mrs. Lubka Stoytcheva, Nancy Frankel, Ambassador Tihomir Stoytchev, and Tom Kirlin, winner of the 2019 William Meredith Award for Poetry. From 1964 to 1987 William Morris Meredith served as Chancellor of the Academy of American Poets. associate then Full Professor of English at Connecticut College, where he taught until 1983.
the position which in 1985 became the Poet Laureate Consultant in Poetry to the Library of Congress. Click on the image below to view the 2007 CT Governor's Lifetime Achievement Award for William Meredith. Click on the image below for a video tour of the William Meredith Foundation. The William Meredith Foundation is about to begin a fund raising effort to celebrate the centennial anniversary of William Meredith's birth in 2019. Bulgaria TV News coverage of scattering of William Meredith's ashes. September, 2016. 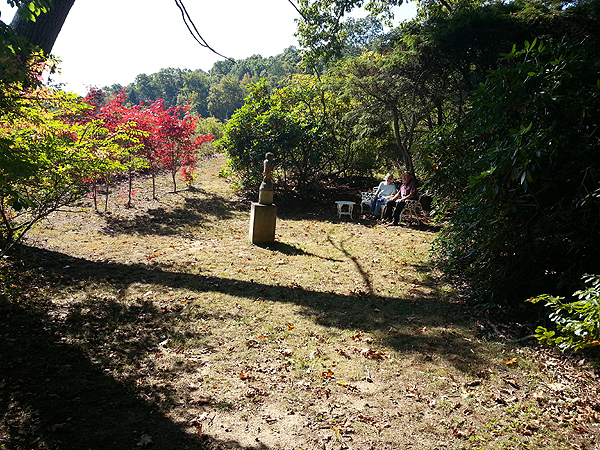 A visit to the Two Trees Garden where William's ashes lie. The William Meredith Foundation is proud to announce the establishment of the William Meredith Center for the Arts to remember and honor a great American spirit. Friends who have come together as a foundation wish never to forget this extraordinary human being and the impact he has had on so many lives. Poet, pilot, arborist, beloved teacher and friend, his legacy is a treasure we wish to pass on to future generations. 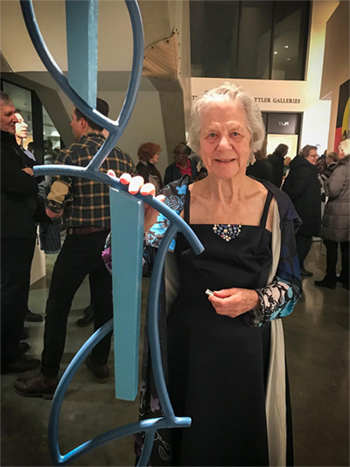 The Meredith Center will keep the flame of generosity and artistic camaraderie burning at Riverrun, William's home on the Thames River in Connecticut where he lived and worked for 60 years and which has recently been added to the State Registry of Historic Landmarks. The center sponsors educational programs during the year to provide cultural enrichment through a diverse selection of artistic programming. It fosters an appreciation for the work of local and regional artists and develops artist exchange programs internationally as well, particularly with the Republic of Bulgaria where Mr. Meredith was made a citizen by presidential decree for his work in the culture. Artists invited for residencies at the Meredith Center share their talents through art exhibitions, readings, publications and academic seminars. The center serves as a retreat where artists can create new works in the same spirit of peace, equality, and serious endeavor that characterized William's life and work at Riverrun. First Lady Hillary Rodham Clinton wrote a letter joining Connecticut College in a celebration of William's 80th birthday in which she says, "The arts have always been a unifying force in our world, bringing people together across vast cultural, social, economic and geographical divisions. Through his work, William Meredith both enhances and strengthens the American spirit. 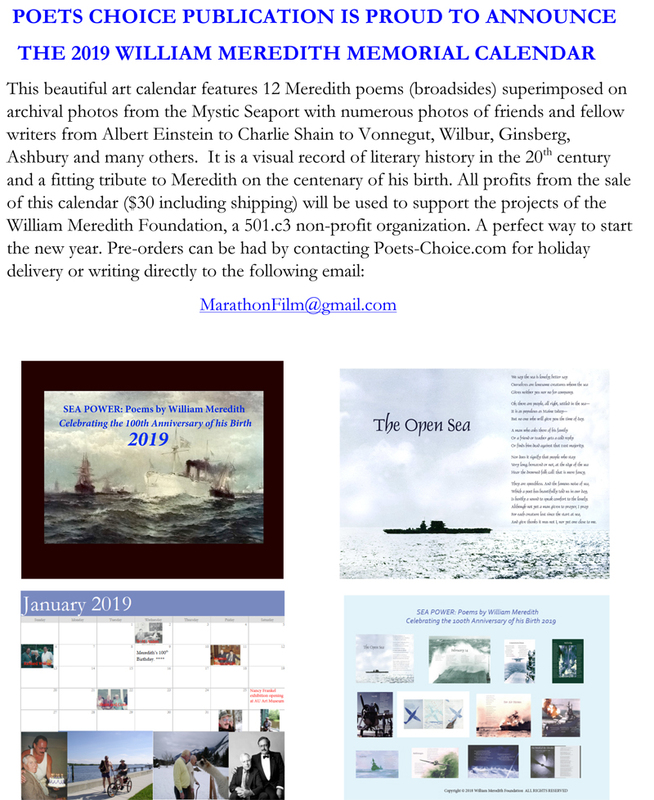 As you honor Mr. Meredith, you celebrate the timeless power of poetry and poets as our American memory, our purveyors of insight and culture, our eyes and ears who silence the white noise around us, and express the very heart of what connects us, plagues us, and makes us fully human."